The treatment of paralysis and other spinal conditions could be changed forever thanks to a new innovation from scientists based at the University of Melbourne. 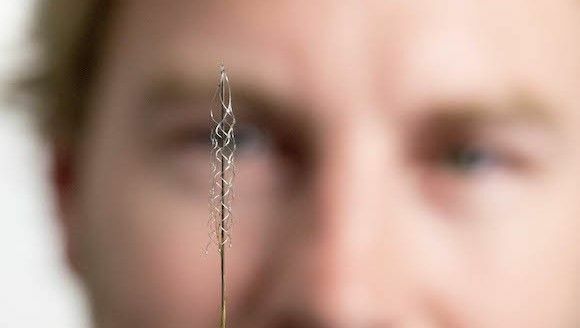 Presented in the latest issue of scientific journal Nature, the tech consists of a stent-based electrode (referred to as a 'stentrode') which is planted within a blood vessel and positioned next to the brain. This stentrode monitors brain activity, identifies signals relating to the movement of muscles and limbs and sends that data direct to a bionic limb or linked exoskeleton. More importantly, the strentrode (which is roughly the size of a paperclip) can be implanted with relative ease and doesn't require potentially dangerous invasive surgery. "We have been able to create the world's only minimally invasive device that is implanted into a blood vessel in the brain via a simple day procedure, avoiding the need for high risk open brain surgery," comments Dr Thomas Oxley, principal author of the paper and neurologist at The Royal Melbourne Hospital and Research Fellow at The Florey Institute of Neurosciences and the University of Melbourne. Said tech is purely bound to the realm of theory either - the team behind the strentrode are already planning human trials next year. If these prove successful, this radical new brain link could soon be available to the public.